The Designer Series 125 in the VARIFOLD Folding Partition Line represents the most cost-effective and versatile choice in folding doors. With its 125mm wide and 12.5mm thick panel core, the Designer Series 125 is an easily operated, durable, and stylish room divider. The VARIFOLD® Designer Series 125 line of folding doors is engineered with a 125mm wide and 12.5mm thick medium density fibreboard (MDF) panel core, creating a visual barrier that divides space easily and economically. A wide variety of surface finishes are available to compliment any room design. It also features VARIFOLD®-patented “sensory action” factory-extruded vinyl hinges, heavy duty aluminum railtracks, two polymer-molded on steel ball bearing carrier wheels, and “tongue and groove” jamb post receptacles with self locking flexible vinyl seals. It is manually operated and capable to be installed up to 2.5m in height. The VARIFOLD® Folding Partition revolutionized the use of space in homes, offices, schools, restaurants, and other establishments. With the rising cost of space, a VARIFOLD® Folding Partition is a wise investment...and a beautiful way to be efficient. Throughout the years, VARIFOLD® has remained the choice of architects, interior designers, contractors and home owners. With over 45 years of experience in the business of providing you with folding partitions, why settle for a copy when you can have the real thing? 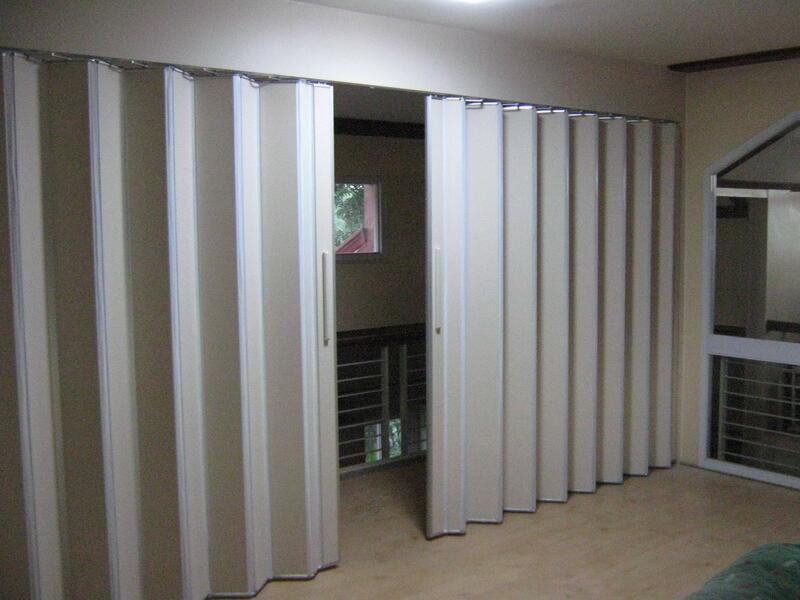 VARIFOLD Folding Partitions come in a variety of finishes to suit every decor specification and budget requirement. You may choose from varnished or painted Philippine Mahogany, Nylex vinyl laminates in plain, colored, textured and woodgrain finish, wallpaper, ducco painted, with acrylic inserts, and much more. The combinations are endless for those who demand aesthetic perfection. Get the clear height of the opening from the finished floor to the ceiling. If the floor has a covering, such as carpet, measurement must start from the top of the covering. Do not subtract for clearance. Then measure the opening's width (the horizontal distance between jambs or between walls). - Double Draw Opening with Center or Off Center Meeting. - Free Hanging with Double or Multiple Meetings. - Sliding Wall Attachment w/ Post Inside Storage Pocket. - Fixed Wall Attachment inside Storage Pocket. Single Draw Opening: Partition shall be permanently attached on either end for single draw openings. If security features are to be used, either right hand or left hand stack should be specified with the cylinder lock/latch to be installed on the face or reverse side of the door indicated in the architectural or shop drawings. Double Draw Opening: Partition shall be permanently attached on both ends for double draw openings. Opening can meet at center or off center of the partition line. Free Hanging: Partition jamb post maybe latched at both ends. Free hanging are equipped with two jamb post and maybe used for single opening, joining pairs or multiple units in a one partition line. 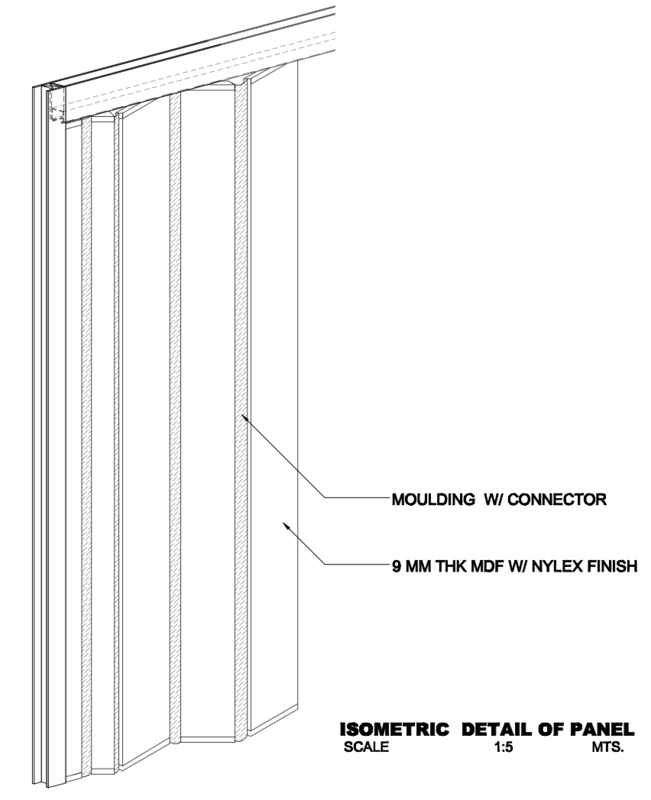 Sliding Wall Attachment with Post inside Storage Pockets: A post jamb is attached to a sliding wall attachment that is recessed inside a storage pocket maybe furnished upon specification. Storage pockets shall be done by others. Fixed Wall Attachment inside Storage Pocket: Attachment of partitions is similar to No. 1 (Single Draw Opening). The whole or part of the folding partitioning stacking depth is recessed inside a storage pocket.